Oneida’s Urban collection gives an impressive nod to the future, while celebrating the motion and movement of the potter’s wheel. 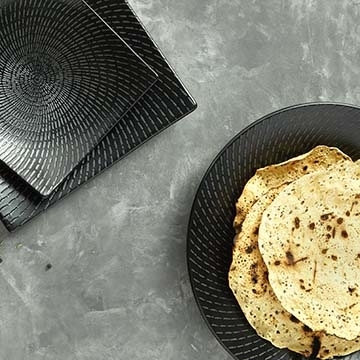 Not the average matte black, Urban offers a unique spiraled surface that combines a handcrafted sense of relief carving with artistry of batik textiles. Urban enjoys an ever-increasing range of shapes and sizes. Center plate focus draws the eye where it belongs – to the food. Couple all of this with Oneida’s reputation for quality and durability and this collection is sure be cherished by diners, chefs and operators alike.